Alex Bowman picked up the 3rd last-place finish of his NASCAR Sprint Cup Series career in Saturday’s Spongebob Squarepants 400 at the Kansas Speedway when his #7 Accell Construction Chevrolet fell out with a vibration after he completed 125 of the race’s 267 laps. The finish was Bowman’s 2nd of the 2015 season, his first since Las Vegas, 8 races ago, and occurred in his 46th series start. He now holds 2nd in the 2015 LASTCAR Cup Series Championship, one finish behind leader Landon Cassill. Last Sunday at Talladega, Bowman finished a season-best 16th, rebounding from his lone DNQ of the season in the Daytona 500 after his fast car was wrecked in his Budweiser Duel. 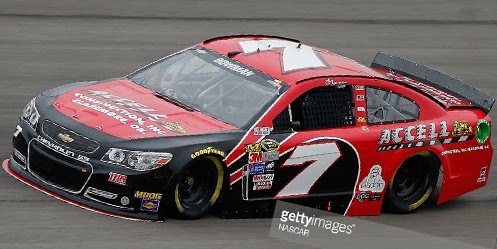 Between his last-place run at Las Vegas and last Sunday, Bowman had finished no better than 20th, ironically his only race this year without any sponsorship on his #7 Chevrolet. Rumors arose last month that Bowman’s team owner Tommy Baldwin will merge his organization with BK Racing, but as of this writing, there has been no official word. At Kansas, Bowman carried sponsorship from longtime Baldwin supporters Accell Construction, Inc. His black-and-red Chevrolet ran 35th-fastest of the 44 entrants in the opening session, 37th in Happy Hour, then scored the 36th starting spot at an average speed of 187.559 mph. The lone DNQ of the race was Brendan Gaughan, who for the fifth time six races was unable to break the Top 36 in Premium Motorsports’ #62 Adam’s Mark Chevrolet. The 43rd spot in Saturday’s race belonged to Michael Annett and the #46 Allstate Peterbilt Group Chevrolet for HScott Motorsports. By the end of Lap 1, Annett moved past 41st-place starter Landon Cassill, whose Carsforsale.com Chevrolet trailed the field until Lap 5, when Brett Moffitt took it in his first start for Front Row Motorsports since Phoenix. On Lap 8, Moffitt’s #34 Dockside Logistics Ford was edging ahead of Matt DiBenedetto’s #83 Burger King Toyota when two of DiBenedetto’s BK Racing teammates tangled on the backstretch. First to spin in the first caution of the night was rookie Jeb Burton, whose #26 Maxim Fantasy Sports Toyota looped down to the inside of the backstretch. Moments later, J.J. Yeley, whose silver #23 Dr. Pepper Toyota apparently made contact with Burton, lost control in Turn 3 and backed into the outside wall. Although Yeley’s team had to apply several large strips of black tape to the rear of the #23, it was Burton who first lost a lap to race leader Joey Logano, dropping Burton to last. Bowman’s troubles began on Lap 19, when his #7 slowed suddenly from the 30th spot and dropped to the apron in the tri-oval. The car re-fired by the entrance of Turn 1, apparently pointing to an ignition problem, but within two laps, he was on pit road with smoke in the cockpit. Unable to diagnose the situation, Bowman’s car, now 43rd, was pushed behind the wall. Although he would return to the speedway until Lap 112, now 92 laps in arrears, his team apparently benefitted from the two-hour rain delay which began after Burton spun once more on Lap 95. Burton’s two spins either caused or made worse a rear gear issue that sent his #26 behind the wall after 127 laps, and after returning to run 2 more circuits on Lap 170, he was in the garage once more. This gave Bowman an opportunity to slowly reel in Burton for 42nd. However, first Bowman and then Burton retired their cars for good in the final laps, leaving them in the final two spots. As Bowman and Burton attempted to complete the race, the rest of the Bottom Five shuffled dramatically in the final 80 laps, lifting the struggling cars of David Ragan, Michael McDowell, J.J. Yeley, and others outside of the final few spots. 41st ended up going to Denny Hamlin, whose #11 FedEx Freight Toyota spun out, then cut down a right-rear tire that caused him to crash on Lap 209, dropping him to the Bottom Five just one lap later. 40th went to Erik Jones, whose first official start in the #18 M&M’s Red Nose Day Toyota was punctuated by several daring moves that kept him in the Top 10 all night long - until, while running 6th, his machine lost control and nosed into the outside wall. 39th went to the #14 Bass Pro Shops / Mobil 1 Chevrolet of Tony Stewart - his 4th bottom-five finish of 2015 - his car damaged after he was rear-ended by Moffitt while slowing for Matt Kenseth’s Lap 131 spin. *This is the first last-place finish for the #7 since this same race in 2013, when Dave Blaney’s #7 SANY Chevrolet, also fielded by Tommy Baldwin Racing, crashed after 36 laps of the STP 400. It is also the Baldwin team’s second-consecutive last-place run at the Kansas track, following up Mike Bliss’ run in an unsponsored #37 Chevrolet here last fall. *The 125 laps Bowman completed are the most by a Cup Series last-place at Kansas since Martin Truex, Jr. ran 228 laps before the transmission let go on September 28, 2008. Truex led 27 laps that day. Three times he’s led more, but still not won, including when he led 95 on Saturday.